Is self-regulation in #medtech doomed to fail? The offer by needle and syringe manufacturers to voluntarily cap trade margins at 75 per cent after meeting with the National Pharmaceutical Pricing Authority apparently validates the view that without the actionable threat of price control, the healthcare sector cannot be trusted to self-regulate. 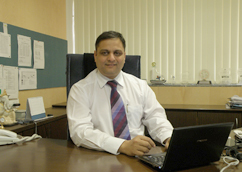 “The NPPA advised manufacturers to consider regulating price themselves; otherwise, the government would be forced to take steps as they have done to cap prices in the past for items like stents and orthopaedic implants,” reported the newspaper Mint quoting a person aware of the matter who spoke on condition of anonymity. The Indian medical devices sector has lately been in the news for the government’s decision to liberate foreign direct investment controls on it. There is also some movement on the regulatory front with a decision to set up government-recognised medical device testing laboratories in the country. Apothecurry’s guest columnist Dr Ravindra Ghooi revisits the one issue that needs immediate attention but for some reason continues unaddressed. The sector’s appallingly unregulated state. Read on. Late last month, the Maharastra Food & Drug Administration wrote to the National Pharmaceutical Pricing Authority (NPPA) to include medical devices in the Drug Prices Control Order (DPCO) which gives the NPPA its power to fix drug prices. Since the NPPA has been on overdrive, recently adding 108 drug formulations to the list of 348 already under price control, this sort of development can no longer be dismissed. On May 2, UK-based trauma care products company Smith & Nephew said it would acquire Pune-based Sushrut Surgicals, a homegrown closely-held maker of orthopaedic implants such as bone plates and screws used to correct fractures and deformities, for an undisclosed sum, from the Pitre family. Medical technology in India: Is the worm turning? A recent edition of TED Talks featured Myshkin Ingawale a co-founder of Mumbai-based Biosense which has invented a needle-free, handheld haemoglobin measuring device. This is big for a country where anaemia or low haemoglobin count is the leading cause of maternal mortality even though iron supplements are cheaply and plentifully available.